Waterfall Info: This is the upper of two small waterfalls on the North Fork of Moccasin Creek. 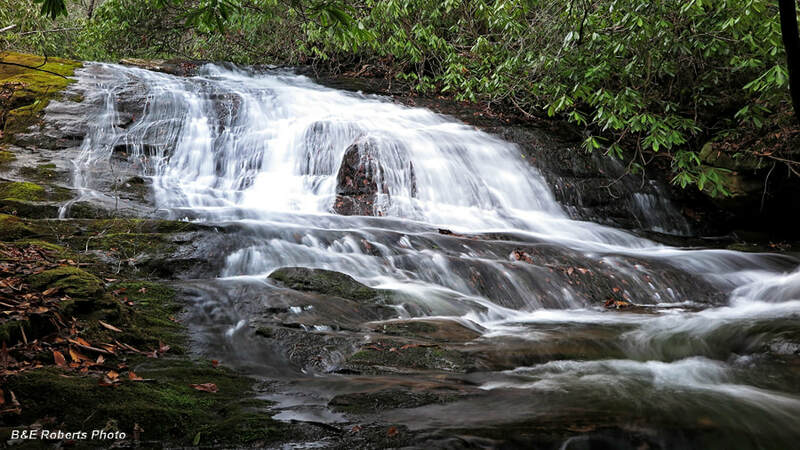 This waterfall is considerably upstream from Hemlock Falls and Upper Moccasin Creek Falls - those two waterfalls are on a section of the creek below the confluence of the two forks. Access Info: The best way to access this falls is to bushwhack from FS 126 off Wildcat Creek Road. However, alternatively, you may keep hiking upstream from Upper Moccasin Creek Falls past the Lower Falls on North Fork Moccasin Creek. You may find sections of an old trail/roadbed, but treat this as an off-trail bushwhack. Bushwhacking between the Lower Falls and Upper Falls on North Fork Moccasin Creek is said to be tough, but this route would let you see all four waterfalls in the watershed in one day.